Do you know someone — or some club — that needs to be reminded of our outing? Pass along a link to this story, or send them a copy of the flyer! 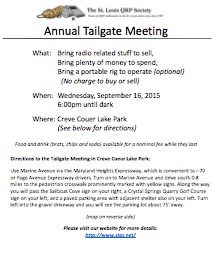 Our Tailgate Meeting starts at 6:00 p.m. on Wednesday, September 16th. This is the regular monthly meeting night, but with an earlier start time and an outdoor location. The club’s brats, sodas and chips stand, known for its good & cheap eats, will be up and running until it runs out. Our location will again be in Creve Coeur Lake Park on the the eastern shore of the lake. Use Marine Avenue via the Maryland Heights Expressway which is convenient to I-70 or Page Avenue Expressway drivers. Turn on to Marine Avenue and drive south 0.8 miles to the pedestrian crosswalk prominently marked with yellow signs. Along the way you will pass the Sailboat Cove sign on your right, a Crystal Springs Quarry Golf Course sign on your left, and a paved parking area with adjacent shelter also on your left. Next to the pedestrian crosswalk and on your left is a large tree with a red number “2” spray painted on the bark. Turn left into the gravel driveway and you will see the parking lot about 75′ away. As always – please bring plenty of money to spend and radio related stuff to sell. Freebies are always welcome! Someone usually brings an antenna or two and we can always use another one. A couple rigs for operating and homebrew projects for show & tell are always well received. More info via email and the Peanut Whistle as we get closer to the date. Rod and Lou were the iron men on CW once again and responsible for about 400 of the 464 total QSO’s on 10M, 15M, 20M, 40M and 80M. Way to go OM’s! Our ops also recorded 19 SSB contacts. The bonus points were taken for emergency power, alternate power (solar), W1AW bulletin (copied by Tom Collinvitti) and our web submission. The club gave our traditional pork steak menu the year off and replaced it with excellent take-out fried chicken with all the trimmings as well as a few treats from Bonnie. We could not have asked for better weather and many mature trees in the yard provided plenty of shade. Nature in its various forms certainly made up for those years where we have been baked, nearly drowned or blew away. Needless to say a good time was had by all. If you were not there you were missed but I believe everyone knows that already. So we hope to see you next year! Plans are already underway to nail down our operating site early on. The photos taken by John AA0VE and Bob K0FHG are now in the photo gallery. Field Day 2015 – In Pictures! What an unbelievable Field Day… propagation was about the worst in recent memory. On the other hand, that had to be the best FD weather ever! Photos should be arriving very soon — you’ll notice a new addition to the web page in the menu above: a link titled “Photos,” which will take you to the SLQS photo gallery. Currently there’s only an album of photos from FD2010, but shortly we should see a few batches of pictures added to the 2015 album, courtesy of Bob K0FHG and FD Chairman Jon AA0VE. Check back soon! 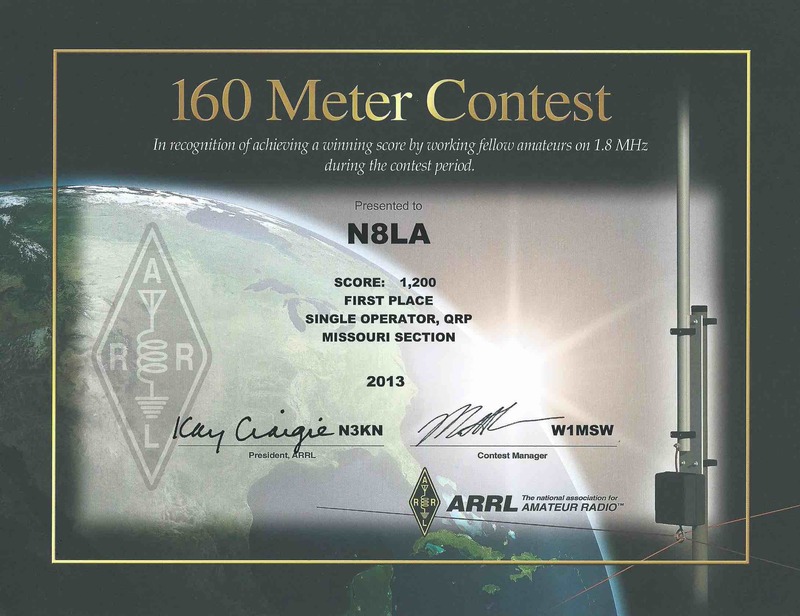 Congratulations to Lou Axeman, N8LA, who landed top honors for Top Band in the 2013 ARRL 160 Meter Contest. 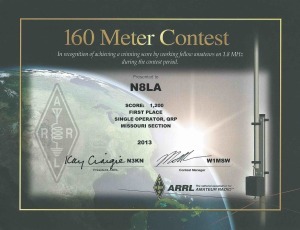 Lou scored 1,200 points to earn First Place, Single Operator, QRP in the Missouri Section. Hats off, Lou, for a job well done. FB! 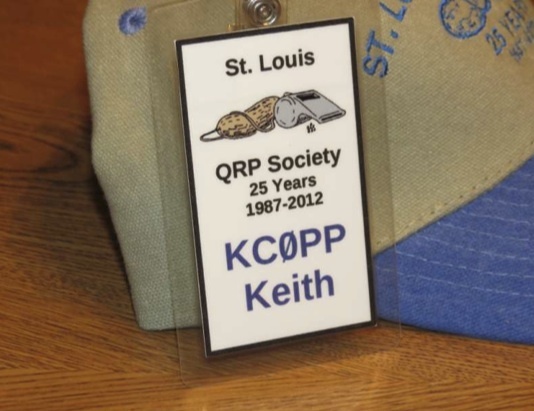 Each November, the St. Louis QRP Society meets for an annual dinner. Traditionally this is the time for members to renew their membership. If you’re interested in joining the club, this would be a perfect time to drop in, meet the group, have dinner, and join the club. Thanks one more time to John Lonigro for his yeoman work arranging for the new site, our 15M and 40M antennas and his skillful administration for this event. And, to Larry Naumann and Tom Brown for the 20M and 80M antennas respectively. Never to be forgotten – Chef Keith Arns for yet another super pork steak dinner. 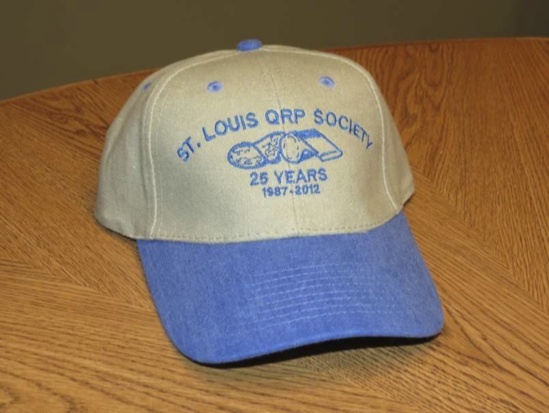 On November 14th, 2012, the members of SLQS celebrated our club’s 25th anniversary. The event was held at Syberg’s Restaurant in Maryland Heights. Thirteen members attended the event. To help celebrate our anniversary, the club provided a few special gifts for the members. Each received a new ball cap embroidered with “St. Louis QRP Society”, our “peanut whistle” logo, and the legend “25 Years – 1987-2012”. New name badges with the “25 Years” annotation were also presented. Special thanks to John Lonigro and Keith Arns for making these surprises for the club. 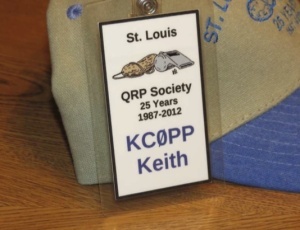 Finally, the special QRP operators were provided by the XYL of Chuck K6QKL. 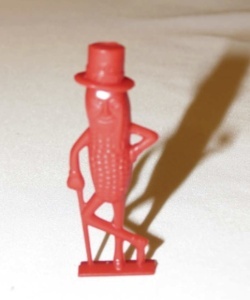 These figurines of “Mr. Peanut” are the original “peanut whistles”, recalling our newsletter’s name “The Peanut Whistle” representing low power. Our next meeting will be Wednesday April 17th at 7:30 PM. See the “Meeting Info” tab above for more information.